I’ve noticed there are more dairy-free options available in the grocery stores lately. Things like almond, rice and soy milk have been around for a while, but the other day I noticed hemp milk and almond yogurt are also available. This may be due to the growing trend of more health-conscious consumers. Or perhaps people are becoming more aware of the fact that dairy is a common allergen. It is often the culprit for a list of unexplained symptoms. It can cause gastrointestinal upset, excess mucous production, skin issues, and recurrent ear infections in children. Almond milk is a great source of antioxidant vitamin E. Unsweetened Silk Almond Milk is a good brand because it contains no added sugar and uses sunflower lecithin instead of carrageenan as a thickening agent. Processed carrageenan (derived from red seaweed) should be avoided as it can cause serious gastrointestinal issues. The best way to avoid nasty preservatives is to make your own from scratch. I have yet to find the time to do this, but it’s on my “to-do” list! Click here for a shopping guide to avoid foods with carrageenan. Not all foods are on this list, but at least now that you’re aware you can check your labels! 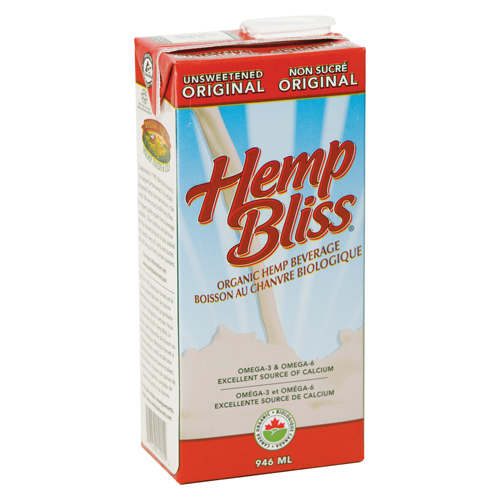 Hemp milk has a nutty hemp flavour, and is a source of omega-3 healthy fats, calcium and protein. I would recommend the organic unsweetened Manitoba Harvest brand; it contains no added sugar or carrageenan and is non-GMO. Warning: it has a distinct hemp flavor so if you’ve tried hemp seeds, and don’t like them than I would recommend almond milk instead. 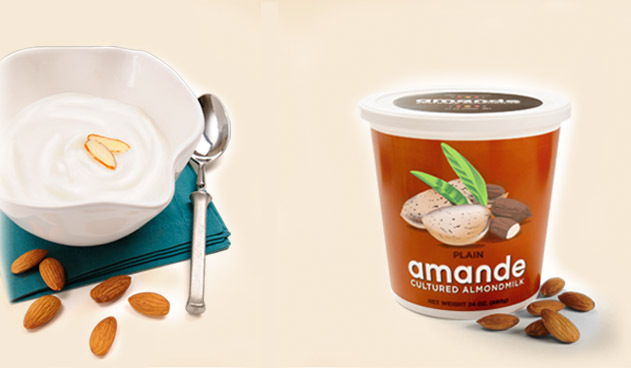 Amande is a great brand for almond yogurt. It’s non-GMO, soy-free, gluten-free and doesn’t have any carrageenan. They also contain live bacteria cultures, which is great for healthy digestion. And if you feel like something other than plain for a change; they have lots of different flavors, which are sweetened with real fruit juice. If you’re trying to cut back on your dairy intake; this is a good yogurt alternative. I know this is dairy, but goat’s milk tends to be more easily digested than cow’s milk. If you don’t have a serious dairy allergy you may want to give this a try. 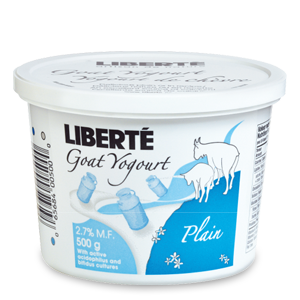 Liberte is one of my favorite Canadian dairy companies, and they sell good quality goat’s milk products. Ice cream is one of my favorite desserts, and I definitely have to treat myself to the real thing once in a while, but if you’re craving ice cream and want to avoid the dairy, fat and sugar; I have a really good fake. Basically you blend chopped, frozen banana with almond milk & natural peanut butter. It’s sweet, and has a similar texture to ice cream. – Seafood: oysters, shrimp, sardines. The little bones in sardines are a great source of calcium, and one can is only 130 calories & 17g of protein! Add them to a salad with a squeeze of lemon & sprinkle with sea salt. If you don’t experience any symptoms as a result of consuming dairy than there’s no need to switch, but just make sure you buy good quality dairy products (Canadian company or organic). And to ensure that you don’t develop an allergy to dairy (that can happen when we over-eat certain foods); switch it up – buy dairy milk one week and almond milk the next.